Purpose of Grants: Promote knowledge and love of gardening as well as to encourage responsible stewardship of the environment among students. Innovative projects involving gardening, horticulture, agronomy, entomology, environmental sciences, life sciences and earth sciences will be considered. Project goals will be defined and measurable. Need Help? Have more questions? The CGCofCW will work with applicants to answer questions. Contact us via email at CGCofCW_Philanthropy@yahoo.com. 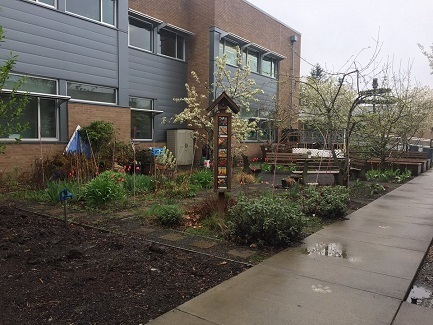 Helen Baller Elementary School, Camas School District, “Pollinator Garden”. The school will be expanding their already existing gardens to include a specialty garden designed to attract pollinators – bees, butterflies, and birds! It is still a little early to get started due to this spring’s very wet weather, but, here is a picture where the pollinator plants will be planted. Washougal High School, Washougal School District, will be adding to the existing collection of their school Library with the purchase of additional Gardening Books. Washougal/Excelsior High School, Washougal School District, “Garden to Table”. This is a collaborative effort which includes culinary arts, job training and the “garden to table” program. This project team will build eight raised garden beds, fill them with quality compost, then plant with a variety of vegetable and herb “starts”. The gardens will be tended by students throughout the season who will then harvest, prepare, cook, process and/or can it. The 2017-2018 grant programs encompass a wide variety of innovative projects within the Camas and Washougal school districts. Teacher, Jemtegaard Middle School, Washougal School District. “Jemtegaard Club8 Hydroponics Project”. After school student Club8 participants will be responsible for running Design of Experiments (DOE) in order to understand the growing parameters around a specific vegetable type, i.e. green beans, which will be used for open source automated recipe development. Students will learn about and participate in running DOEs, managing a lab set up, plant development, construction of growing units and hydroponics. Librarian and Teacher, Green Team Sponsor, Dorothy Fox Elementary School, Camas School District. “Go Outside and Get Your Hands Dirty!” Funds will be used for books, speaker honorariums and project supplies. The school librarian will select and order books for the library that encourage students to go outdoors and explore, make things from natural/recycled materials, garden, plant, grow, prepare food and participate in work to protect the environment and ecosystem. Utilizing parent volunteers, some projects (featured in the purchased books) will be available for students to complete in the library during the winter and/or inclement weather. Teacher/Librarian, Prune Hill Elementary School, Camas School District. “Library Gardening Collection”. Grant funds will be utilized to purchase new books that are student age-appropriate and in compliance with current Common Core Standards. Collections of books covering gardening, entomology, agronomy, environmental and earth sciences, etc., will be established. Extended Learning Coordinator of Preschool and Before/After School Programs, Washougal School District. “Learn, Grow, Explore” is an extension of the Preschool Gardening Program at four elementary Schools in the Washougal School District. Grant funds will be utilized to expand five classroom libraries to include additional science literature and gardening curriculum as well as the purchase of two additional composters, plants, seeds and garden expansion materials. The “Growing Minds Farm to School” program will be utilized for gardening lesson plans. Focus will be on the 3 R’s, composting principles and deployment, study of regional native plants with an emphasis on their importance in the local ecosystem. Extended Learning Coordinator partnering with Washougal High School Teacher, Washougal School District. “Culinary Arts Garden Project”. 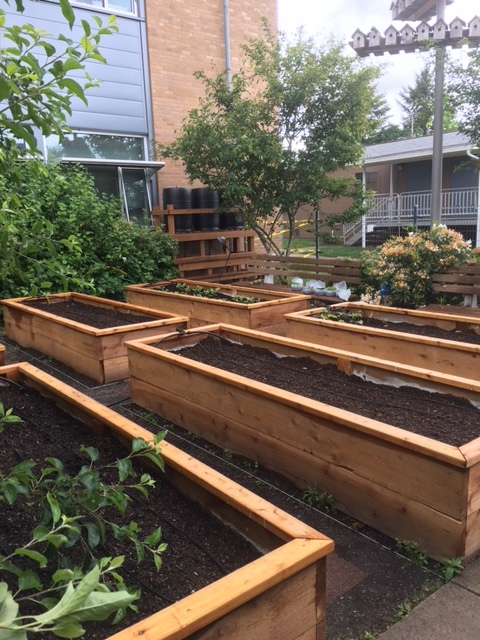 Grant funds will help repair existing raised garden beds that are being moved to a new location, provide for additional needed beds, seeds, seedlings, soil and a water source. The garden and greenhouse will serve as the foundation for the “Culinary Arts Garden Project” and will provide a teaching area for the “Culinary Arts Classes” that include International Cuisine, Food Truck Prep, Baking, Pastry and Advanced Culinary Arts. The gardens will be tended by students and the harvested produce will be prepared in the classrooms. The 2016-2017 programs involve students’ in planting, growing, watering and, in some cases, eating from their school gardens. Para Supervisor, Helen Baller Elementary, Camas. “Rain Water Collection System for School Gardens” will add rain barrels to collect water from the school buildings to be used to water portions of the student’s existing gardens at the school. Early childhood development coordinator for Washougal District. Adding to the existing garden beds at three pre-schools in the Washougal school district, “Expanding Our Preschool Gardens” will enhance the existing student gardens. The “Botanical Gardens for SPACE” will develop a botanical garden for the students who attend the before and after school day care area. Both programs will be part of the “plant/grow/eat” program already established in 2015-2016 year. 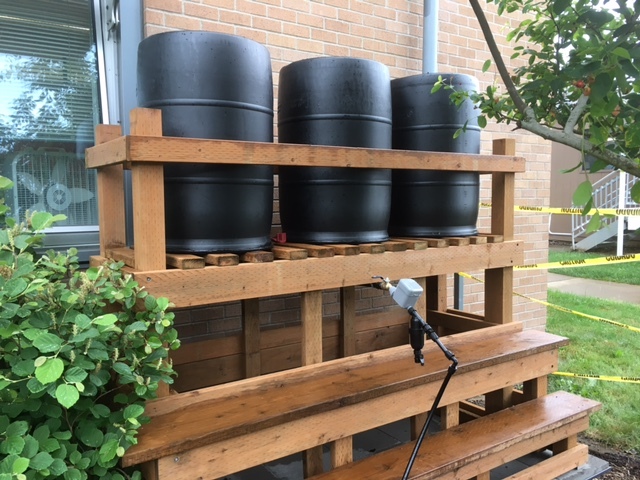 Below is a close up picture of the rain barrels installed at Helen Baller Elmentary in Spring of 2017. Teacher at Skyridge Middle School. The “Native Plant Garden” will be amended with additional native plants (and compost and gravel) as part of the living garden used for the Lewis & Clark curriculum. Librarian at Dorothy Fox Elementary. The “Library Gardening Collection” will grow with the purchase of new book series about gardening and food production. Teacher at Grass Valley Elementary. The “Outdoor Classroom Lawn” area will be planted with a special “no mow”, extra-tough lawn seed able to handle foot traffic as children observe and learn about insects and plants in the surrounding garden area. Early childhood development coordinator for Washougal District. “Our Preschool Gardens” project will provide raised garden beds with individual plots for each 3-5 year old. Garden beds will be built at each of the district’s pre-schools to help teach children the “Plant, Grow, Eat” cycle. Lumber, soil and kid-sized hand tools will be purchased with the grant money. Labor and additional supplies will be provided by older students, teachers, school staff and other groups.